When sea water freezes, ice rarely forms as a continuous, mirror-like sheet. On calm water, the first pattern seen often is that resembling pancakes or lily pads. For pancake ice to form, there must first be some slush in the water. The slush can arise from snow falling on water that is already at the freezing temperature, which for sea water is about −1.8°C (28.8°F). Slush also can form when subfreezing air cools the surface of the water to slightly below the freezing temperature. This condition is called supercooling, because ice does not automatically form. A supercooling of just 0.1°C may be sufficient for tiny ice crystals, collectively called frazil ice, to form, suspended in the supercooled layer. Antarctica is very different from the Arctic. Antarctica is a continent in a hemisphere that is mostly water. The Arctic is mostly ocean, surrounded by mostly land. About one-third of the Arctic Ocean is shallow (i.e., the continental shelf). Over these shelf areas, ice is absent at least part of the year, but ice is found year-round over the deep ocean. Therefore the seasonal variation of the sea-ice area is smaller in the Arctic than around Antarctica. In the Arctic, the sea-ice area ranges between 9 and 12 million square kilometers (km 2 ), as opposed to 4 and 19 million km 2 around Antarctica. As a comparison, the contiguous United States is about 9 million km 2 in size. The area covered by Arctic sea ice is largest about 1 month before spring equinox, and it is least about 1 month before the autumn equinox. For the Arctic, that is late February and late August, respectively. The "pancakes" of pancake ice can be small (shown here) or large, depending on sea and weather conditions when the ice is forming. 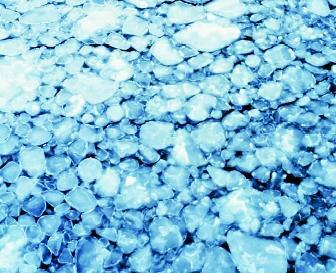 Pancake ice is an intermediate stage in the development of pack ice. Some coastlines of Antarctica, particularly south of Africa (0–70°E), become entirely ice-free in some late summers. The ice-covered area increases in autumn at times when passing weather systems drive ice away from land, or induce low-level divergence over open ocean. This causes cracks of open water, called leads or polynyas. Polynyas occur in wind-swept areas—for instance, where the wind blows offshore. Ice formation is most rapid in these leads, because heat and vapor fluxes into the atmosphere are largest there, causing the surface water to cool. Temperature records indicate that global warming is more pronounced at high latitudes. For instance, Alaska and Siberia have experienced dramatic warming in recent decades. This is consistent with climate model predictions, which indicate that warming will be exacerbated in polar regions. Sea ice has a profound effect on global climate because ice cover has a strong albedo warming feedback: ice reflects solar radiation, whereas open water absorbs most of it. This feedback will affect global temperatures, but mainly the polar summers will warm dramatically. Also, upon sea-ice formation, a relatively heavy brine results, which sinks to form bottom water in the oceans. In other words, sea ice relates to the deep-ocean circulation, which in turn relates to global climate. If sea ice no longer forms, then communication with the massive reservoir of cool deep-ocean water is cut off, and global warming will be more rapid. For these reasons, scientists are carefully monitoring the extent and thickness of sea ice. Satellite data indicate that Arctic ice cover and thickness have decreased since the 1970s. (A historically long-term global record of sea ice is, unfortunately, not available.) Satellites have monitored the break-off and movement of large slabs of ice from Antarctic ice shelves, particularly since the 1990s. * These events probably also occurred in the past, although they were not observed then, and hence they are no clear indication of climate change. Sea ice moves about by a combination of ocean currents and winds. This was demonstrated in 1893 when Fridtjof Nansen intentionally sailed his vessel, the Fram , into the Arctic pack ice. The Fram drifted clockwise around the pole, and the drift was generally to the right of the mean (average) wind. Icebergs do not result from the freezing of sea water, but from the calving (breaking off) of chunks of either continental glaciers or ice shelves ; hence, icebergs consist entirely of fresh water. * Glaciers, around Greenland for instance, produce irregularly shaped icebergs. 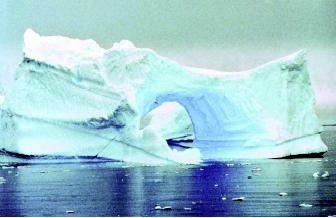 Ice shelves, such as the Ross and Filchner Ice Shelves around Antarctica, produce tabular icebergs with flat tops. Icebergs float because the density of ice is lower than the density of sea water. The ratio of the submerged mass of the iceberg to its total mass equals the ratio of the density of ice to that of sea water—about 7:8. In other words, only a small portion of an iceberg (one-eighth) will be above the water surface; hence the expression "tip of the iceberg." The number of icebergs varies seasonally and from year to year. The speed and path of iceberg drift also varies, depending on iceberg size and shape, ocean currents, waves, and wind. Average drift speed is less than 1 kilometer per hour, but speeds exceeding 3 kilometers per hour have been observed. Most icebergs remain at higher latitudes. For example, of the 15,000 to 30,000 icebergs calved annually by the glaciers of Greenland, only about 1 percent ever reach south of 55°N (55 degrees North latitude). Extreme drift occasionally can bring icebergs to lower latitudes. One iceberg from Baffin Bay within the Arctic Circle was among the rare drift events, and one that made history. The RMS Titanic, a great ocean liner believed to be unsinkable, made its maiden voyage from England to New York in 1912. Just before midnight on April 14, while traveling at 22 knots, it collided with an extremely drifted Baffin Bay iceberg estimated to be 70 to 150 meters long and 20 to 40 meters high above the water surface. The fatal collision happened at a latitude of merely 42°N, roughly the same as that of Cape Cod, Massachusetts or Rome, Italy. Unlike sea ice, which contains some salt, icebergs are composed entirely of fresh water. Since the 1990s, the commercial harvesting of icebergs has evolved from a novelty to a potential growth industry. Although towing Antarctic icebergs to provide fresh water to arid regions was a topic of discussion in the 1970s (and was first demonstrated in 1971 in Newfoundland, Canada), such proposals were dismissed as impractical. Yet iceberg deflection now is practiced, when necessary, in managing icebergs to protect the offshore oil industry and international shipping. Iceberg-watching has become a major tourism activity. Holes, tunnels, and unusual shapes and colors increase their appeal. Icebergs also have been considered as sources of fresh water, and in Newfoundland are being commercially harvested for specialty products. Iceberg tourism and iceberg harvesting also are expanding ventures. Major tour companies as well as smaller "ecotourism" operations offer patrons up-close encounters with icebergs. An Alaskan company harvested icebergs floating in Alaskan waters and sold the ice to a firm in Japan as a novelty. A private company based in Newfoundland has been extracting ice from ice caps and grounded icebergs since the mid-1990s. If markets evolve, the extractive industry could become a more widely recognized use of these natural fresh-water sources. Grapples, augers, saws, and other excavation equipment extract large pieces of ice, which are crushed, stored, and transported to an onshore processing plant (although floating offshore plants are possible in the future). Ice is used for ice cubes; meltwater is filtered and bottled for drinking water, beer, and vodka. Like the bottled water industry, the iceberg industry relies on marketing to help drive consumer demand. Marketing programs rely on the pristine and emotive images of icebergs, and appeal to niche markets at the premium end of the price and quality spectrum. Moreover, the physical qualities of iceberg ice make it attractive to consumers seeking a novelty. As the ice melts, carbon dioxide gas bubbles long trapped under pressure within the crystal lattice are released. The escaping bubbles create a natural "fizz" similar to naturally carbonated groundwater that is brought to the surface by wells or springs. Ice shelves produce 60 to 80 percent of all icebergs, including some of the largest. As noted earlier in this entry, icebergs calved from ice shelves are relatively clear, tabular, and flat-topped. (Icebergs from glaciers tend to contain sediment and rock fragments, and hence are not as likely to be used for water supply.) Consequently, water from icebergs has been "locked up" as ice since it originally fell as snow and was eventually compressed into glacier ice tens of thousands of years ago, long before global pollution from human sources was a concern. Iceberg water therefore is touted as "natural" and "pure" relative to public water supplies and even bottled water supplies that come from underground springs. Except for these small entrepreneurial efforts, icebergs remain only a theoretical source of fresh water. Yet the volume of water they could provide dwarfs existing supplies from rivers, lakes, and aquifers. For example, in 1987, an iceberg with an area of 6,350 square kilometers broke off from Antarctica's Ross Ice Shelf. With a mass of about 1.4 trillion metric tons, this single iceberg theoretically could have supplied everyone in the world with 240 metric tons of drinking water. SEE ALSO Brines, Natural ; Climate and the Ocean ; ; Glaciers, Ice Sheets, AND Climate Change ; Global Warming and the Ocean ; Nansen, Fridtjof ; Oceans, Polar ; Sea Water, Freezing of ; Sea Water, Physics and Chemistry of . National Snow and Ice Data Center / World Data Center for Glaciology. International Ice Patrol (IIP) Iceberg Sightings Database. Boulder, CO: NSIDC, 1995. Digital media. Parkinson, C. L. et al. "Variability of the Arctic Ice Cover 1978–1996." J. Geophys. Res., Oceans 104 (1999):2847–2856. Rothrock, D. A., Y. Yu, and G. A. Maykut. "Thinning of the Arctic Sea-Ice Cover." Geophysical Research Letters 26 (1999):3469-3472. Curtis, Wayne. "The Iceberg Wars." The Atlantic Monthly, March 2002. <http://www.theatlantic.com/issues/2002/03/curtis.htm> . Ice, Bergs, Etc. Virginia Institute of Marine Science. <http://www.vims.edu/bio/microbial/NBPice.html> . Judd, Neville. "Water Conscious Canadian Firm Harvests Icebergs." Environmental News Service, 2002. <http://ens-news.com/ens/aug2000/2000-08-29-11.asp> . NSF Office of Polar Programs. <http://www.nsf.gov/od/opp> . What is Sea Ice? Scientific Committee on Antarctic Research. <http://www.antcrc.utas.edu.au/aspect/seaiceglossary.html> . Although huge icebergs receive the most media attention, smaller pieces often escape radar, and hence pose a threat to unwary ships. Small broken pieces of iceberg ice are known as bergy bits. Growlers are even smaller, about the size of a grand piano. * See "Glaciers and Ice Sheets" for a photograph of a calving valley glacier. * See "Glaciers, Ice Sheets, and Climate Change" for a photograph showing the breakup of the Larsen B Ice Shelf in 2002. * See "Nansen, Fridtjof" for a photograph of pack ice. I'd like to know why iceberg harvesting is not more seriously considered NOW. It didn't make any commercial or ecological sense in the 70's when the world's population was about 4 billion. It seems like a scientific imperative now given inevitable population increase and climate change/rising sea levels/desalination of the sea water due to melting icebergs . If there was an ecologically/energy neutral way of harvesting potable water from melting icebergs you could make the deserts of Africa, the Middle East, Australia, Sth America bloom. Why are we spending so much money on desalination plants when it makes more sense to get fresh water from the source and slow rising sea levels? You could then grow enough plants (food)/carbon dioxide sinks on these continents to slow down global warming. like how do you cut up icebergs? Is there a laser that will cut ice without introducing steam/heat into the equation? How do you get huge chunks of ice onto the decks of supertankers and melt them down with maximum energy efficiency? Given the winds in these areas wind power would seem to be a good idea. I am wondering with the warming of the planet, could the harvesting of the icebergs increase warming of the oceans. Doesn't the reflection help to keep it colder? If you remove the ice from your drink, does it get warmer? Could removing of the icebergs do more harm than good? Vodka and beer are not a good reason to harvest. As for the oil industry, could any of the residue of extracting oil contribute to melting of icebergs? Many questions not many answers. As has been said. Not much is known.